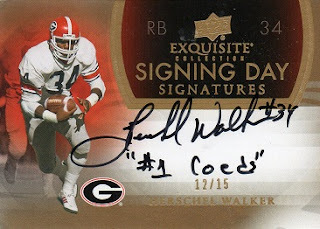 Another from the Upper Deck Exquisite line, this 2011 autographed card features a signature, and also a line that in some way references the player's alma mater. Here, Herschel Walker pays tribute to the beautiful female students at the University of Georgia by writing, "#1 Coeds." Herschel's first wife, Cindy, was in fact, a fellow student at Georgia. 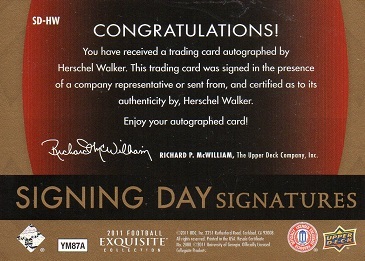 The card is serial numbered to just 15, with this example being #12.